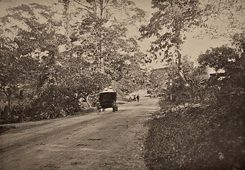 Churchill Road in 1910 | © Goethe-Institut Myanmar The colonial residence set in the small park at the end of Kabar Aye Pagoda Road, in colonial times known as Churchill Road, is a particularly splendid example of the private villas which emerged around the 1920s in Rangoon. The final years of the First World War signified the golden, economically most successful era of the city. At the time Yangon was one of the most important ports in the British empire where the riches of Burma - mainly rice, teak and other desirable tropical woods - were shipped all over the world. 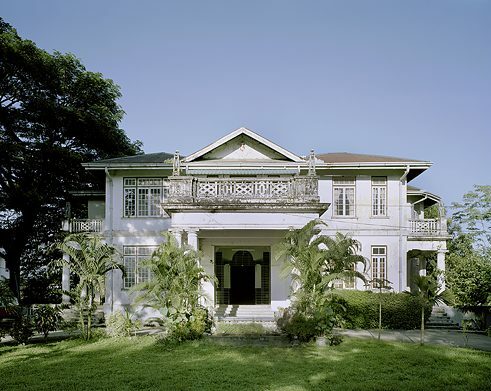 The small number of foreign businesspeople – invariably Europeans, Chinese, Indians – who quickly acquired a fortune as in this economic boom built grandiose houses like this one in the green, often jungle-like suburbs of Rangoon. Judging by the coat of arms to be seen on the gable, in our case the owner of the villa was probably a European. 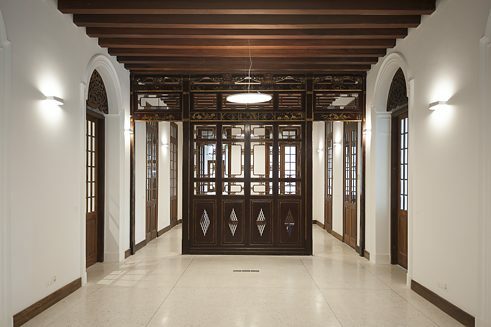 Yet as early as early 1920s the house was purchased by the Chinese merchant Chan Chaw Paing who adorned its ground floor with those Chinese stylistic elements which have now been restored to their full glory. 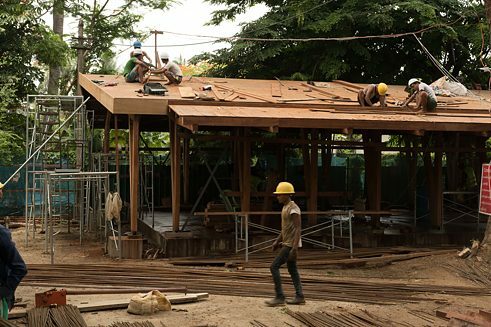 Aung San and the AFPFL working in the villa | © Goethe-Institut Myanmar The major downturn came with the Second World War and the Japanese attack on Yangon and British Burma. In 1942 many rich foreign families fled Rangoon alongside the retreating British army, heading to China and India. The owners of the villa were no exception, and it stood empty until the end of the war. 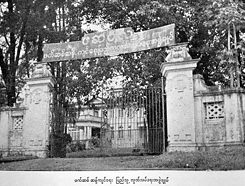 In early 1945 General Aung San turned the house into the headquarters of his independence party, the Antifascist People‘s Freedom League (AFPFL), a coalition between the army and various leftist political groups. 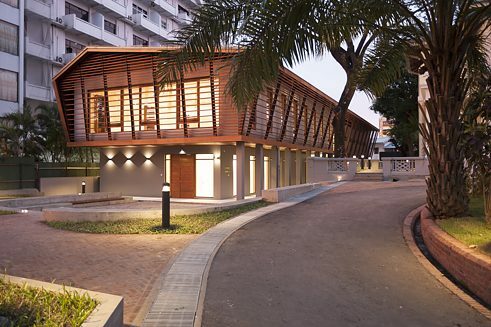 The villa as AFPFL headquarters. 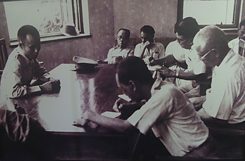 | © Goethe-Institut Myanmar Until the assassination of Aung San in July 1947 the villa constituted an historical space of paramount discussions and meetings, resulting in the resolutions and demands for complete independence from the colonial government. After being granted independence, and particularly after the split within AFPFL, the house lost its political significance in favour of the new government headquarters, the Secretariat. A few months prior to independence the country’s first prime minister U Nu is said to have lived with his family at the rear end of the house. 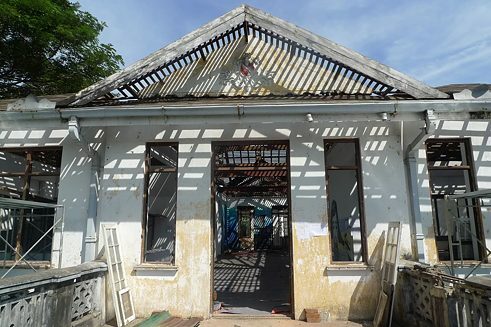 The old villa in 2016 before the constructions began. A new chapter began for the villa with the establishment of the new State Academy of Arts during the first years of General Ne Win’s dictatorship. From 1967until 2006 state-run art education took place in the grand parlour of the villa; the longest acting director was the Dresden-trained sculptor Soe Thint. 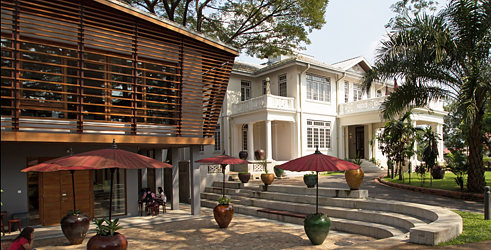 Several of the famous contemporary artists in Yangon began their careers here. During their studies many lived in the side-tract specially built for this purpose. Today the newly built library and auditorium stand in its place. In 2003 the art academy moved to the building called Lim Chin Tsong Palace and in the newly established University of Arts and Culture in South Dagon. Every now and then the villa still functioned as a venue for exhibitions by the national artists‘ association. 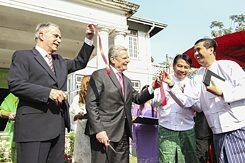 The opening of the Goethe Villa in the presence of Federal President Joachim Gauck in 2014. 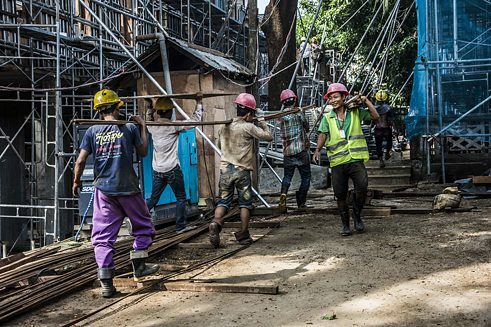 | © Imelda Taurina Mandala The political opening under President Thein Sein’s reform government provided an opportunity to pursue the old cause of re-opening a Goethe-Institut in Myanmar. The first Goethe-Institut in Yangon was founded in 1959, preceding the institutes in Manila, Jakarta and Bangkok as the first in South-East-Asia. However, it was closed-down only few months after Ne Win’s military coup in 1962. 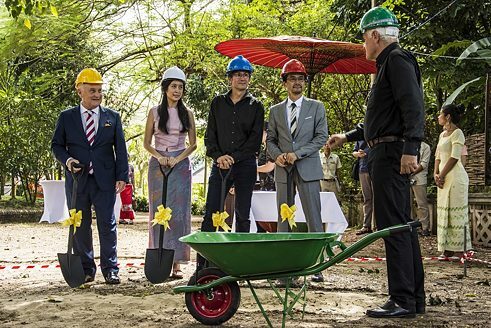 The year of 2012 paved the way for negotiating a cultural agreement between Myanmar and Germany, during which the Minister of Culture at the time, U Aye Myint Kyu, offered the villa, in dire need of renovation, as a future venue for the Goethe-Institut. 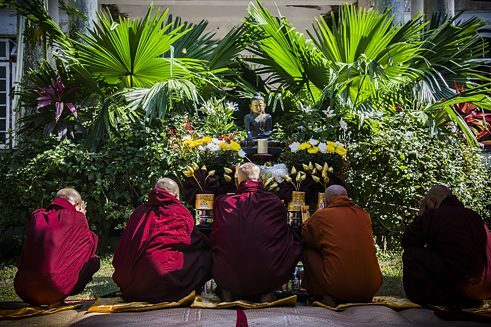 On February 11 in 2014 a ceremonial opening of the institute took place on the lawn of the villa in the presence of the German Federal President at the time, Joachim Gauck. 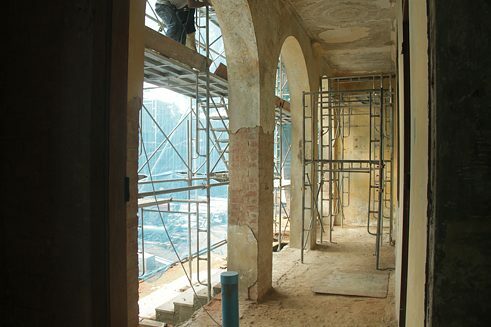 Then followed negotiations of a long-term lease agreement, the first concerts and art exhibitions of the institute (making it known as the „Goethe Villa“in the Yangon cultural scene), the decision of the German Foreign Office in Berlin to invest several million Euros in the renovation of the historical villa and the construction of three new surrounding buildings, and the inception of the initial planning by the Berlin architecture firm Gerhartz. 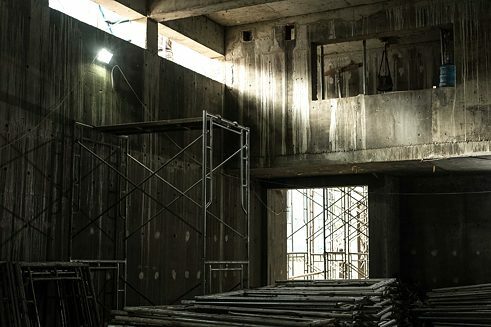 The construction works, executed by the Yangon firm Tokyo Enterprise, began on November 1 in 2016 and were completed in May 2018. 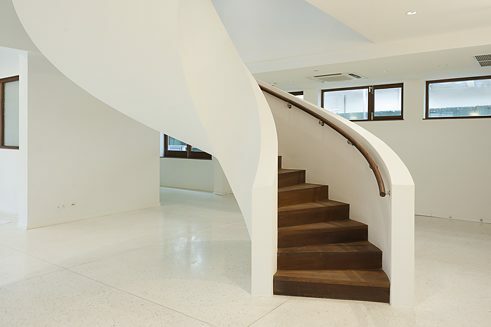 The result is one of the most beautiful Goethe-Instituts among the 160 centres all around the world. For the old villa this means a new beginning as a place of learning for young Myanmar citizens who wish to prepare for studies in Germany through our language classes and new library, and as a place of cultural encounters and creative exchanges between artists from Myanmar, Germany and Europe.